A couple of quick plugs for the weekend ahead for all you Melbourne-based arty-types – I’ll be hosting an event for Australian Poetry at The Wheeler Centre on Saturday the 14th May. It’s called one.seven.six and will feature readings from Terry Jaensch as well as Susan Hawthorne, Elizabeth Beaton, Trevor Ball and m d west. You can find out more by going clickety-click right here. 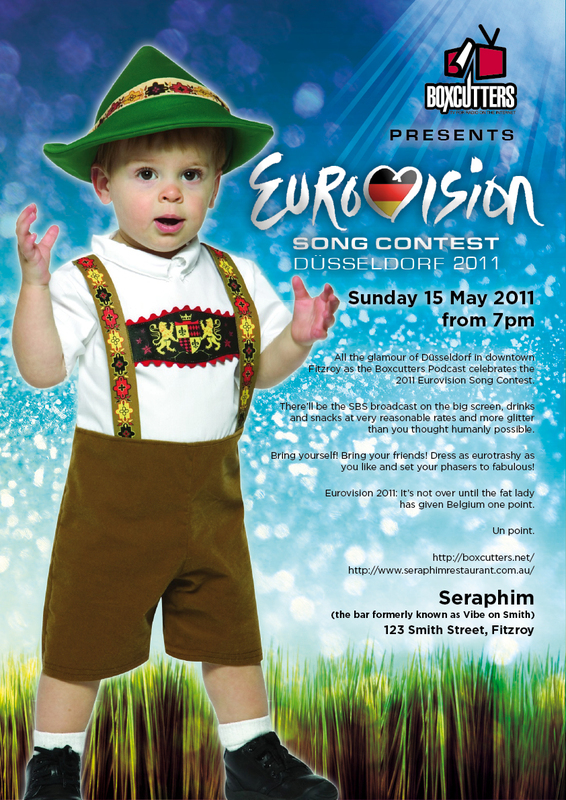 Then on Sunday night it’s the official Boxcutters Eurovision Party at Seraphim (formerly Vibe on Smith), 123 Smith Street, Fitzroy. Look at the classy poster! This entry was posted on Thursday, May 12th, 2011 at 9:35 pm and is filed under events, literature, music, pop-culture. You can follow any responses to this entry through the RSS 2.0 feed. You can skip to the end and leave a response. Pinging is currently not allowed.